To monitor progress of Development works and operational activities, DGs Conference was held at NTC HQs. 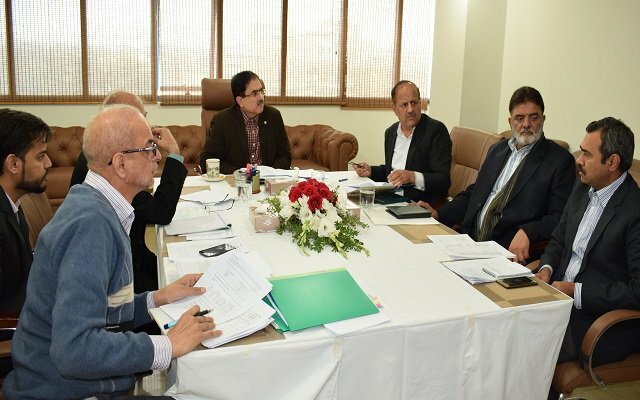 Brig (R) Viqar Rashid Khan, Managing Director NTC chaired DG’s Conference to monitor the ongoing Operational and Development activities of the Corporation. DG (Technical), while giving detailed briefed on newly established National Data Centre, highlighted its capabilities and its business model/strategy. NTC to Participate in CPEC Projects. It was apprised that as per the directions of Minister of IT, Ms. Anusha Rehman, all the data /Services of National IT Board (NITB) have seamlessly been migrated onto NTC platform while the requests of other departments are in queue. MD was also briefed on actions about Public Private Partnership (PPP) arrangements made by NTC to oblige its role under Telecom Policy 2015. Recently, an MOU has also been signed with Telecard/Supernet whereas similar agreement will shortly be signed with Microsoft Corporation. MD expressed his satisfaction on the achievements made so far and hoped that NTC will strive to provide good quality services from its platform to NTC Valued Customers. It was heartening to mention that despite the decline in use of fixed telephone lines, NTC subscriber base is increasing. Regarding operationalization of Coastal Fibre link which was non-operational since 2006, MD directed to take measures on war footing for its revival and to link Gawader with Karachi. He informed the house that as per NTC mandate and Pakistan Telecom Act 1996, NTC is also striving to undertake projects under China Pakistan Economic Corridor (CPEC) to play its role in ICT Sector for Government of Pakistan. At the end, MD NTC appreciated the efforts made by its employees to maintain higher QoS services and rapid technical development. He also asked Management to meet the assigned targets KPI’s within given time frame. He was hopeful that during current F.Y 2016-17, NTC would be able to complete its 100% ADP projects which will be a record in Public Sector Organizations.